Glasgow Defence Campaign: Police and university management violently evict occupation at Glasgow University - students respond with more occupations! Police and university management violently evict occupation at Glasgow University - students respond with more occupations! 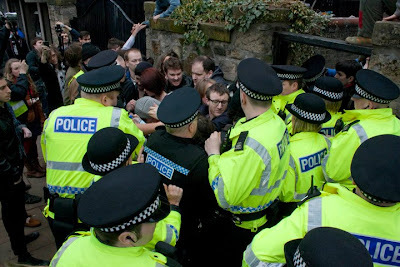 Today, Glasgow University management and security called in Strathclyde police to forcefully evict occupiers at the Free Hetherington (Hetherington Research Club). No warning was given to those who have held the building for 7 weeks in opposition to attacks on education and the wider public spending cuts in general. Around 100 police, dog teams, 18 police vehicles and a helicopter were deployed to evict 15 students inside the building. Hundreds of students, academic staff and supporters rallied to the occupation in support. The Glasgow Defence Campaign is clear that the statements of Strathclyde police and University management that there were 'no major incidents' and the eviction resulted in 'no injuries' is a categorical lie and pure propaganda. Students were assaulted, female protesters were hospitalised, five protesters were arrested but then released, and one student was assaulted by police, taken to the Western Infirmary hospital and then held in police cells at Stewart Street police station before finally being released with a charge of obstruction. In response, over one hundred students occupied the university's senate and forced senior management into a mass meeting with students in the occupied space. Once again, Strathclyde police have shown their commitment to violence, political policing and attacks on democratic rights. This will be fought. Defend the right to education!